Using the drag-and-drop feature in Windows, we can easily copy, move, and create shortcut to a file or folder. Though the specific drag-and-drop action depends upon the location of the file/folder. If you drag a file/folder from your desktop to a folder – it is moved, however, if the file/folder is on a flash drive or another partition – it is copied. This default behavior can be easily altered by keeping the Alt (copy file), Ctrl (create shortcut), or Shift (move file) key pressed while dragging. If rather than using the default behavior, you would like to set a specific action for drag-and-drop in Windows, then check out Drag’n’Drop Editor software. To set a custom action, just download the software, run it, and select the specific action you want. Changes are immediately set. No system or Explorer restart. Once set, all dragging-and-dropping action will be the one you selected, regardless of the file/folder location. If you still ever need any other function, you can get it using the Ctrl, Shift, or Alt key. To uninstall and restore to default Windows setting, run the program again and click on the “Uninstall Explorer tweaks” button. That’s it! Simple and easy to use. 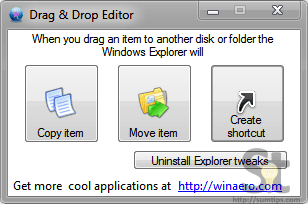 Drag’n’Drop Editor works on all versions of Windows from XP to 8. For Windows 8 users, there is a separate version of the program available inside the downloaded zip file. As for XP users, they will have to install .Net Framework 3.5 (You can get it from the download section on SumTips).